Extreme Programming (XP) teams gain direction and confidence by being test-driven. Teams learn what needs to be built by writing tests and gain confidence in their work by running those tests. This has worked so well in practice for customers and programmers on XP projects that it provokes the question, "Can managers also benefit from being test-driven? Like much of what makes up XP, test-driven management lends a new name to an old and sound practice. Test-driven management enables development managers to ensure that the software their teams produce meets the organizational intentions of business managers (also known as Gold Owners). Why would XP require this? Test-driven management is necessary because Gold Owners frequently dont communicate their organizational intentions and business objectives to XP teams. While Release Planning does an excellent job of elucidating what features are needed, it falls short when it comes to explaining why. For example, scoring a number-one ranking from a premier industry reviewer or achieving 40 percent market share by second quarter next year are clear business objectivesyet nothing in the XP process keeps such objectives on an XP teams radar screen. As a result, business objectives that ought to inform a teams decisions and actions fail to do so because they go unarticulated. When this occurs, the team can produce finely crafted, fully tested software that doesnt deliver on financial or organizational expectations. Test-driven management addresses this problem by turning the knobs up on two XP values: communication and feedback. Managers on XP projects use test-driven management to clearly articulate and assess organizational intentions and business objectives for their projects and teams. Not only does this give them and their teams confidence that their projects are proceeding according to expectations, it also forms vital connective tissue among management (including executive, business and development managers), customers (including subject matter experts, marketers and salespeople, support staff and analysts, testers and quality assessors) and programmers (including programmers, testers, administrators and database administrators). Test-driven management directs the specification of management tests. A management test is a statement that indicates a measurable, time-limited goal framed in a binary manner: We either achieve the management test or we fail. Good management tests are SMART: Specific, Measurable, Achievable, Relevant and Time-based. Management tests are statements about the world external to the project, treating the project as a boundary of responsibility and authority. They avoid specifying ways in which these external goals (that is, things that occur outside the boundary of the project and the software) should be achieved. In other words, good management tests set a destination, but dont specify how to get there. Management tests are specified in plain English, and must be measurable and undebatable. The measure can be a hard number (50 customer organizations sign up to use our software by December 31) or a perception number (by projects end, a survey of customers happiness shows a 20 percent increase on a scale of 1 to 10). Management tests provide an excellent way for the entire XP teammanagers, customers and programmersto understand what unites them. This echoes Tom DeMarco and Timothy Listers observation that The purpose of a team is not goal attainment, but goal alignment. (Peopleware, Dorset House, 1999, second ed.). Management tests create goal alignment by delineating how and when success will be measured, enabling individuals to understand the effects of their own actions. 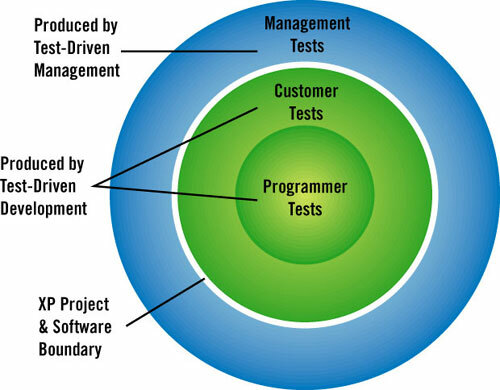 Management tests complement an XP projects customer and programmer tests by adding a test layer around the project itself. While programmer tests assert that small units of code meet programmer expectations, and customer tests assert that whole system features meet customer expectations, management tests assert that organizational returns on investment meet management expectations. With test-driven management, XP teams elicit, clarify, negotiate and codify management tests from their business managers before a project begins. The teams elicit these tests rather than create them, because theyre ultimately answerable to business managers, who provide project funding and resources. What does a good management test do? Ideally, it will balance what the organization would like to accomplish on any given project against available resources. Such a balancing act is properly captured in a project charter (more about this in a later article). Organizational accomplishment comes in two flavors: external and internal. External management tests are focused on the success of the host organization, measurable outside the project and software boundary, and critical to the organizations Gold Owners. Internal management tests are focused on the success of the development organization, measured at or within the project boundary, and critical only to development managers. Open Workspace Creation. By the projects start date, the teams open workspace is established. This test suffered from two serious flaws: Its a development management deliverable rather than a measurable test, and it needs an empirical statement of measurement. Open Workspace Acceptance. By end of project, 90 percent of teams participants report that open workspace increases their personal productivity as compared to working in cubicles. The test now clearly states a measurable effect of the project. To help foster alignment among the pilot projects participants, all of the management tests were placed on large, visible posters in the XP teams open workspace. The management tests made it easy to inform management of the projects progress at various times. To report project status, we simply assessed the management tests and reported results. Business managers and executives, who hadnt been involved in the writing of the management tests, were thoroughly satisfied with them, which provided a dashboard to measure the projects progress. Active Customer Feedback. Per iteration, 75 percent of participating external customers voluntarily provide commentary on the system. About one month into the three-month-long project, we were getting feedback from only about 30 percent of our 11 external customers. That wasnt good, for a team cant be very responsive to customer requests (another external management test) without active feedback. We looked into the problem and found that a good number of the external customers werent being shipped CDs of the software (at each iteration end) because of a licensing issue. Resolving that matter was no trivial task; so, even at projects end, we didnt succeed at the Active Customer Feedback test. Failing a management test provides valuable information to the whole team. Of course, its good to know this information during rather than at the end of a project, while an opportunity to correct the problem(s) is still viable. On the pilot project, the coach and development managers assessed the management tests at the end of each week, since iterations were one week long. During a retrospective at the projects end, the whole team reviewed the management test assessments, learning much valuable information. Buzz Factor. At least 50 percent of surveyed non-pilot employees express interest in engaging in future XP activity by end of pilot project. In pursuit of the Open Workspace Acceptance management test, development managers needed to create the teams open workspace. The trouble was, space was at a premium on the second floor where the projects participants currently worked in cubicles, near their colleagues. So, the coach and development managers decided to establish the open workspace on the first floor, where space was available. The pilot team moved down to the first floor, leaving their colleagues behind. At the time, the team didnt realize that this move would contribute to the failure of the Buzz Factor management test. Placing the open workspace on the first floor reduced the buzz factor to a whisper, since many of the employees didnt take the time to come down to the first floor and check out what was going on with the pilot team. The failure of the Buzz Factor test led management to make an important decision at project's end: Relocate the open workspace to the second floor. This decision arose in planning for new management tests for a phase II of XPs expansion in the company, after management evaluated all of its management tests and learned that the pilot project had been an overall success. Productivity Consistency. For the final three iterations, actual team velocity is greater than or equal to estimated team velocity. Passing this test involved developing proficiency at estimating work during XPs Iteration Planning Game. The test pinpointed the final three iterations of the project in light of the fact that few teams can accurately measure their velocity during early iterations. Once the team could accurately estimate its velocity from iteration to iteration, it could demonstrate productivity consistency. Development managers value such consistency because it allows them to do more accurate Release Planning. Management tests should never state what system features must be completed by a given date, for thats the job of Release Planning. The tests should also not create an environment in which people fear the tests. Management tests are meant to align the intentions and actions of an entire team, which means that the team members must be willing to commit to the tests. Therefore, its best for XP teams to formalize management tests with their business managers prior to embarking upon Release Planning. Test-driven management addresses a shortcoming of XP: accountability to business needs and realities. The best way to resolve this problem is to invite business managers to specify tests that guide development teams and certify their works ultimate business success. Test-driven management and test-driven development work hand in hand to provide direction and confidence to entire project communities. By complementing your customer and programmer tests with management tests, youll have a better chance of achieving important organizational objectives. Joshua Kerievsky is a software development coach and programmer. After programming on Wall Street for nearly 10 years, he founded Industrial Logic (http://industriallogic.com), a company that specializes in Extreme Programming. III, senior jiggler at San Franciscobased Systemodels, works on presentations of system ideas that ignore technology and focus on clarity. He can be reached at (415) TANTRUM. Note: The authors would like to thank Kent Beck and Ward Cunningham for reviewing this article.